Each year AGLA awards one outstanding high school senior with a $2,500 scholarship. 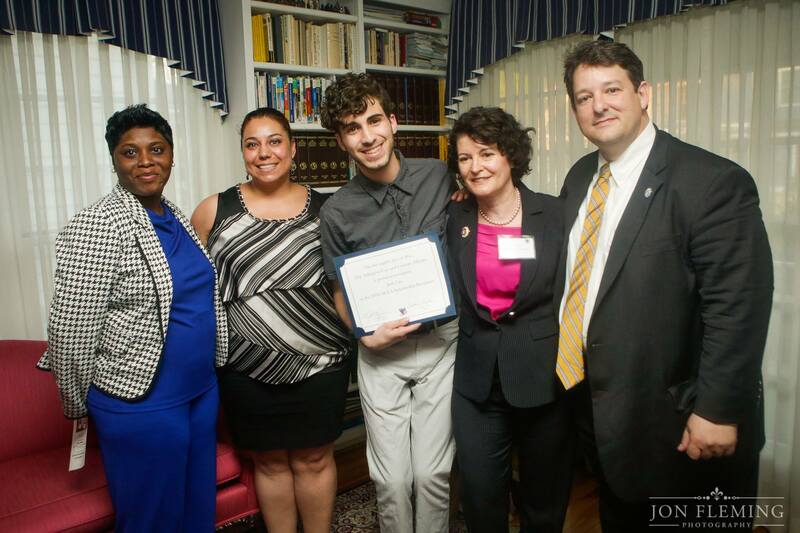 Recipients are members of their school’s Gay Straight Alliance or whose accomplishments demonstrate significant support for the Arlington Public Schools’ policies of diversity, fairness and safety, as demonstrated in an essay. To continue this tradition, AGLA hosted a scholarship reception at the home of Mr Jeffery Litman on Saturday, on May 6, 2017. View the program. The AGLA Scholarship is one of the demonstrable elements of AGLA’s commitment to our community and an opportunity to lend our support to the youth. AGLA has a strong track record of being committed to advancing safe schools policies and ensuring that we have safe schools for ALL our children. Donations may still be made online at www.AGLA.org-donate or by mail to AGLA, P.O. Box 100324, Arlington VA 22210. Please be sure to write on the check or the comments section of the online form that it’s for the AGLA Scholarship Fund. This year, the AGLA Board unanimously approved naming the scholarship in honor of AGLA’s Immediate Past President Tiffany M. Joslyn, who passed away recently in a tragic car crash. AGLA is a strong beacon for equality in Northern Virginia. It’s an inclusive nonpartisan 501(c)(3) nonprofit open to all lesbian, gay, bisexual, transgender, queer or questioning (LGBTQ) people and straight allies. It provides fun social activities, builds relationships with elected officials, and works with civic groups on community service. For more information, visit www.agla.org. AGLA founded its scholarship in 2001 during its 20th anniversary year. By providing some of the resources necessary to attend college, AGLA has helped numerous high school students with a demonstrated commitment to LGBT equality. This is one of the demonstrable elements of AGLA’s commitment to our community and an opportunity to lend our support to the youth. AGLA also held its 2014 Scholarship Reception on May 8 at the home of Virginia State Senator Barbara Favola and Doug Weik. All proceeds of the event go directly to AGLA’s scholarship fund, which supports the award of a $2,500 scholarship to one outstanding Arlington Public High School senior each year. Scholarship recipients are selected based on their demonstrated accomplishments in support of the Arlington Public Schools’ (APS) policies of diversity, fairness, safety, and equality, and/or their membership and activities in their schools’ Gay-Straight Alliance. Created in 2001, the AGLA scholarship fund supports the award of at least one scholarship annually. With over 50 community members in attendance, the evening was an outstanding success. Attendees were treated to an array of hors d’oeurves, desserts, and beverages in the standing-room only space. In her welcoming remarks, AGLA President Tiffany M. Joslyn announced that even before the event started, the Host Committee had pledged over $5,000 for the scholarship fund, and more contributions continue to come in. Joslyn thanked all the donors, but singled out Favola and Weik for opening their home, as well as Jon Fleming Photography and David Rowley of Minuteman Press for their generous in-kind contributions of photography and printed programs and signs. Virginia State Senator Favola welcomed the guests to her home and applauded them for their service to the community, acknowledging the slew of elected officials and community leaders in attendance. She introduced the keynote speaker, Kisha Webster, the Director of Education and Community Engagement for Welcoming Schools, which is a project of the Human Rights Campaign Foundation. Webster spoke passionately about the work being done by Welcoming Schools and the importance of educating and training all faculty and staff members, particularly those in leadership or supervisory roles, on embracing diversity, avoiding gender stereotyping and affirming gender, and ending bullying and name-calling. After several interesting questions from the audience, Webster closed with a challenge for those in the room—to make sure the first school in Virginia to become a Welcoming School is in Arlington. Following Webster’s remarks, Joslyn closed out the program by recognizing the 2014 AGLA Scholarship Recipient Jack Lax with a certificate, stating: “It is because of people like Jack and the work he has done that Arlington will meet Kisha’s challenge to have the first Welcoming School in Virginia.” Photos and video from the event are available on AGLA’s Facebook page: www.facebook.com/OutinNoVA. AGLA is a strong beacon for EQUALITY. It’s an inclusive nonpartisan 501(c)(3) nonprofit open to all lesbian, gay, bisexual, transgender, queer or questioning (LGBTQ) people and allies. We provide socials, build relationships with elected officials and work with civic groups to provide community services. AGLA has helped numerous high school students with a demonstrated commitment to LGBTQ equality. The AGLA Scholarship Fund is one of the demonstrable elements of AGLA’s commitment to our community and an opportunity to lend our support to the youth. For more information, visit www.agla.org.